At dawn last Friday, the Queen Mary 2, accompanied by fleetmates Queen Elizabeth and Queen Victoria, arrived in Southampton for her tenth birthday celebration. During her stay, she was visited by Prince Philip, the Duke of Edinburgh. Also in a celebratory mood, Hapag-Lloyd Cruises have announced some special fares for seven 7-night summer cruises on the world’s top-rated cruise ship, Europa 2. And elsewhere, itineraries and fares have been announced to the Pearl Seas’ first season on the Great Lakes. On Friday, the Duke of Edinburgh joined Cunard Line’s celebration of the 10th anniversary of their grand flagship and the largest ocean liner ever built, the 2,620-berth Queen Mary 2, as she arrived at her home port together with her fleetmates, the 2,092-berth Queen Elizabeth and 2,014-berth Queen Victoria. 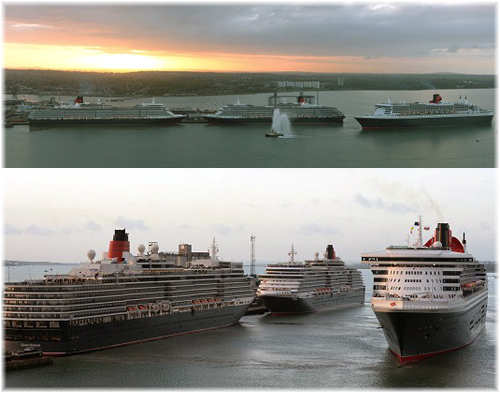 Southampton is the only port to have hosted the three Queens together three times. The ships arrived at first light to begin a day of spectacular celebration with a birthday salute to Queen Mary 2, with ships’ foghorns sounding out across Southampton water in the early morning light as she arrived at the end of her 2014 World Cruise, in company with her two fleetmates. The three ships had sailed together from Lisbon. During the morning, His Royal Highness, the Duke of Edinburgh, visited several behind-the-scenes areas on board Queen Mary 2 to meet crew who perform all the essential roles on board. He spent time in the ship’s laundry, crew gym, training room and library and one of the crew bars. After meeting officers and the masters of all three Queens, the Duke was given a tour of the largest bridge at sea and invited to sign the visitor’s book. At the special reception, His Royal Highness unveiled a portrait of the Queen Mary 2 by maritime artist Robert Lloyd, which Cunard commissioned to commemorate her first decade of service. Queen Mary 2 then hosted a special reception and lunch on board for invited guests in the presence of the Duke of Edinburgh, who last visited the ship when accompanying Her Majesty Queen Elizabeth II to name her in 2004. In the evening, a ten-minute firework display, one minute for each of Queen Mary 2’s ten years in service, created a spectacular send-off before the flagship led her younger sisters down Southampton water towards the sea. Queen Mary 2 set off on her special anniversary Transatlantic Crossing to New York with the ship’s designer Stephen Payne and her first master, Commodore Ron Warwick, among the speakers on board for the crossing. Of her fleetmates, Queen Elizabeth departed on a short break to Hamburg while Queen Victoria sailed for the Baltic capitals. Since 2004, Queen Mary 2 has undertaken a total of 419 voyages including over 200 Atlantic crossings, called at 182 ports in sixty countries and has carried more than 1.3 million guests. During 2014, she will offer nine westbound and eight eastbound Atlantic crossings in addition to her usual cruises. From the same shipyard as Queen Mary 2, Hapag-Lloyd Cruises’ 516-berth Europa 2 entered service in 2013, and in recognition of this ship’s first full year at sea, Hapag-Loyd Cruises has announced a birthday gift for intending clients. On seven cruises this summer guests can enjoy cruising the Mediterranean at a very good value fare for the highest-rated cruise ship in the world (per Berlitz Complete Guide to Cruising & Cruise Ships 2014). In a guaranteed Veranda or Ocean Suite Category 0 stateroom they will pay only £2,730 per person, cruise only, in double occupancy. Savings are up to £1,500 per person. In addition, Europa 2 has a special introductory offer for the UK market, with a 10-night cruise leaving Southampton on June 25 for Barcelona. Fares start at £3,990 per person in double occupancy, including free business class flights back from Barcelona. A 2-night sampler cruise also leaves Hamburg for Southampton on June 23, with fares from £840 in this case with free business class flights to Hamburg. Unlike her fleetmate, the 408-berth Europa, which concentrates on the German market, Europa 2 serves the international market and full English-language services are offered on every departure year-round. Hapag-Lloyd Cruises also offers international cruises in the 184-berth expedition ship Hanseatic. The new ocean-going cruise line Pearl Seas Cruises, operated by the same owners as American Cruise Lines, will be offering a full series of small-ship itineraries on the Great Lakes and St Lawrence River this summer. For this, they will use their new six-deck ship, the Pearl Mist, now undergoing final outfitting at Chesapeake Shipbuilding in Maryland. The 210-passenger vessel, the first of what is intended to be a new fleet of small ships, is 335 feet long with a 56-foot beam and registered in the Marshall Islands. Pearl Mist begins her inaugural season with an 11-night sailing from Baltimore to Halifax on June 25. From there, she begins a series of 7-, 10- and 11-night Canadian Maritimes, St Lawrence River, Thousand Islands and Great Lakes cruises. Those who enjoy small-ship sailings will appreciate product perks such as a complimentary cocktail hour with hors d’oeuvres before dinner, as well as complimentary beer and wine with lunch and dinner. Pearl Mist’s staterooms and suites are spacious by small ship standards, ranging from 302 to 580 sq ft. All 108, including 10 single cabins, have private balconies while an elevator connects all passenger decks. The ship also has several wheelchair-friendly staterooms. Suites include two rooms plus bath with 580 sq ft of space. 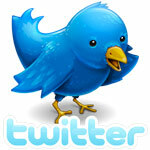 Room service is complimentary and laundry service is also available. 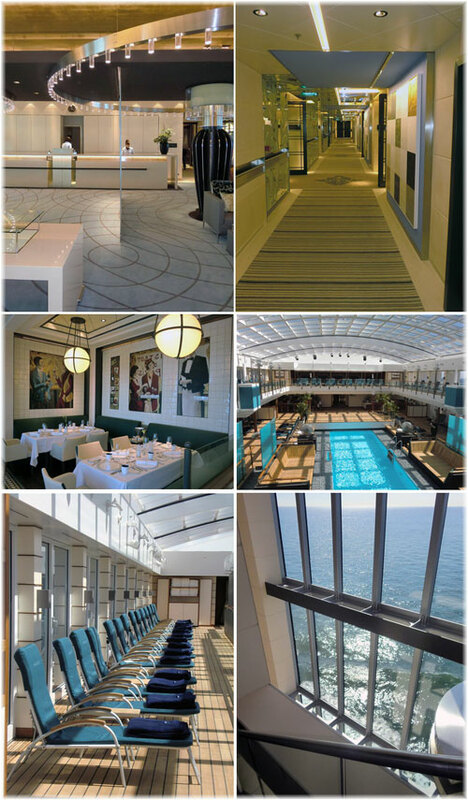 The ship has six lounges, a library, theatre and lecture room, computer work stations, fitness area and spa facility. Open sun decks on the forward part of Deck 5 and all of Deck 6 allow passengers to enjoy scenic views, while sunshades are available on Deck 6. The ship also carries bicycles and kayaks for the use of passengers. Pearl Mist’s windowed dining room, located on the Main Deck aft, is open sitting and dress is resort casual. On board entertainment includes live music such as light jazz, culinary demonstrations, performers from local ports of call, and lectures focused on the history and ecology of the destinations visited. Pearl Mist will operate 10- or 11-day “Great Lakes & Georgian Bay” cruises from Toronto to Chicago or vice versa on July 30, August 9, 20 and 30. Ports will include Windsor, Midland, Parry Sound and Little Current, Ontario, as well as Mackinac Island and Holland, Michigan. For those wanting a 14-night cruise, in September Pearl Mist will sail between Chicago, Montreal and Portland on two different cruises calling at Trois-Rivières and Quebec City, as well as Kingston, Ontario. In addition, an 11-night “Great Lakes & Thousand Islands” cruise is planned between Quebec City and Chicago. Ports of call include Clayton NY (Thousand Islands), Toronto, Niagara Falls, Windsor, Sault Ste Marie and Holland, Michigan. Either side of that, on July 9 and October 8 and 18, she will sail 10-night “Canadian Maritimes” cruises between Portland Me and Quebec City, calling at Charlottetown, les Iles de la Madeleine, Gaspé, Percé and the Saguenay Fjord. 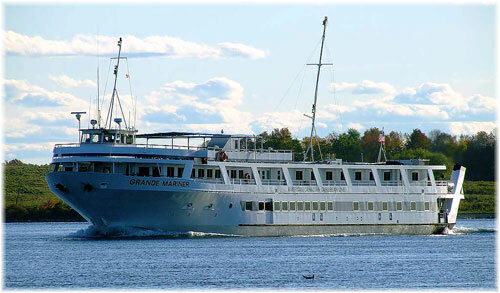 On October 29, Pearl Mist will position southward with a 14-night cruise from Portland ME to Freeport, Bahamas. Ports of call will include Williamsburg, Boston, Charleston, Savannah, Jacksonville and West Palm Beach. Travel Dynamics International was also to have operated the 130–berth Yorktown on the Great Lakes this summer but her program has been cancelled for rchnical reasons. This leaves only Blount Small Ship Adventures, with the 100-berth Grande Caribe and Grande Mariner and St Lawrence Cruise Lines with the 64-berth Canadian Empress to back up the Pearl Mist’s small ship offerings. In addition to the small ship offerings, Plantours’ 400-berth Hamburg will offer two 16-night round trip cruises from Montreal to Chicago this October. Built for the Great Lakes trade in 1997, this vessel has visited the lakes many times previously as Hapag-Lloyd’s Columbus. She last visited the Great Lakes in 2011.